The Green Lady, aspect of the greenwood, appears among the leaves, a peaceful presence watching over the forest. 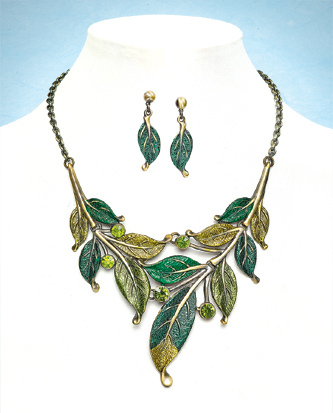 Feel the spirit of the forest with this magnificent necklace, leaves and crystals in varied greens on an antiqued brass-tone chain. Adjusts from 16-20". Comes as a set with coordinating post earrings.